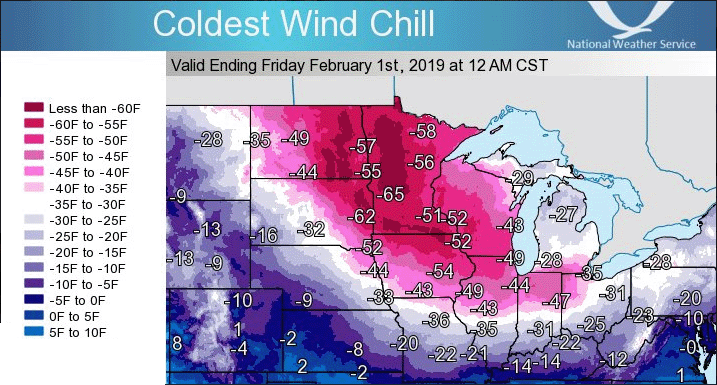 Earth's Most Notable Cold Blast of 2019 Headed For Midwest U.S. Above: The Great Lakes as seen at 1852 UTC (12:52 pm CST) Sunday, January 27, 2019, from the NOAA-20 polar orbiting satellite. 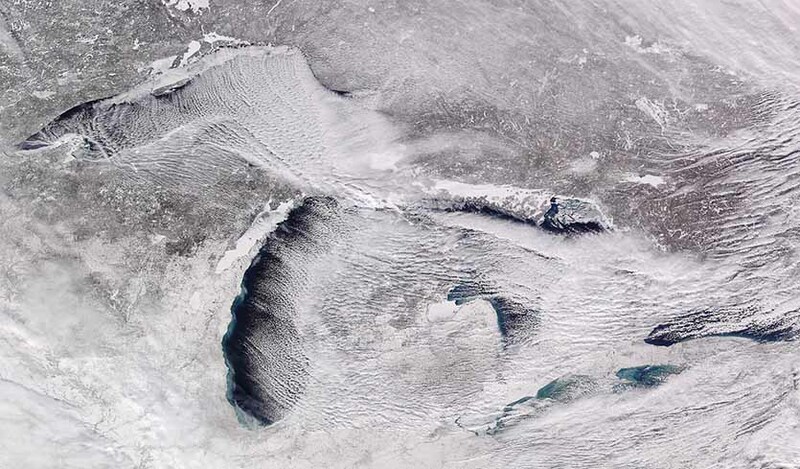 Arctic air from Canada was spilling over the lakes, creating heavy lake effect snows to the lee of all five lakes. Image credit: CIMSS, SSEC, UW-Wisconsin. A fierce blast of Arctic cold is on its way to the Midwest U.S. for Tuesday through Thursday, one that has the potential to set Earth’s first all-time cold records of 2019. While relatively few such records are likely to fall, a large number of all-time low maximum records (daily highs) may fall, due to the multiple-day length of the cold wave. Also notable will be the extreme wind chills that will accompany this event: west to northwest winds of 10 – 20 mph will blow during the coldest period, resulting in dangerous wind chills below –40°F to portions of 12 states. On Sunday, ahead of the main event, the temperature fell to a frigid –46°F in International Falls, Minnesota—tied for their fifth coldest reading on record, along with a –46° reading from Jan. 21, 2011. Their record is –55°F in 1909. The culprit behind the cold blast is a lobe of the stratospheric polar vortex that is setting up shop across the Great Lakes, far south of its usual position. Figure 1. Coldest wind chill readings predicted from Monday, January 28 through Friday, February 1, 2019. Twelve states are predicted to experience winds chill readings of -40°F or colder (pink colors). 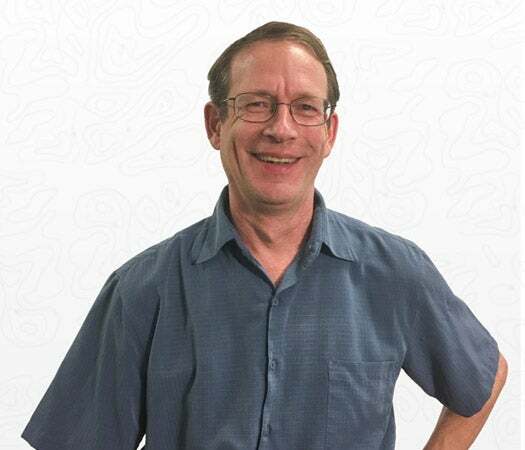 According to climatologist Brian Brettschneider, the coldest wind chill in Minnesota data appears to be –70°F at International Falls on Feb 2, 1996 (temp –45°F, wind 9 mph). Image credit: NWS. 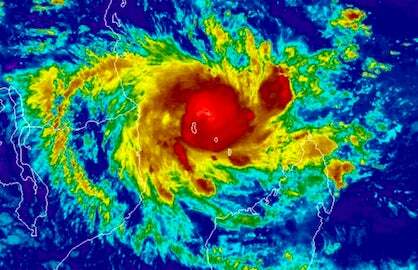 What kind of records are most likely to fall? The coldest air temperatures with this Arctic outbreak will extend from the northern Great Plains to the western Great Lakes. Within this region, there will likely be a number of daily record lows, especially on Wednesday and Thursday morning. In many locations, the cold will be the most intense in 20 years or longer. The all-time coldest temperatures in the northern Plains and Midwest are tough to beat (see Figure 2 below), but at least one or two all-time record lows cannot be ruled out. Because the intense cold will be sustained over two to three days, the odds will be boosted for daily and all-time record-cold maxima. The all-time lowest daily highs at Chicago (–11°F on Jan. 18, 1994 & Dec. 24, 1983) and Rockford (–14°F on Jan. 18, 1994, and Jan. 6, 1912) are both in jeopardy. For Wednesday, the NWS office in Chicago is predicting highs of –14 in Chicago and –15°F in Rockford. Record low highs have been considerably more common than record lows lately. Over the 365-day period ending Monday, according to the NOAA U.S. Records site, the nation saw a total of 11,404 daily record lows and 17,795 daily record-low maxima. Both of these were far eclipsed by the number of daily record highs (21,907) and daily record-high minima (35,563). Figure 2. 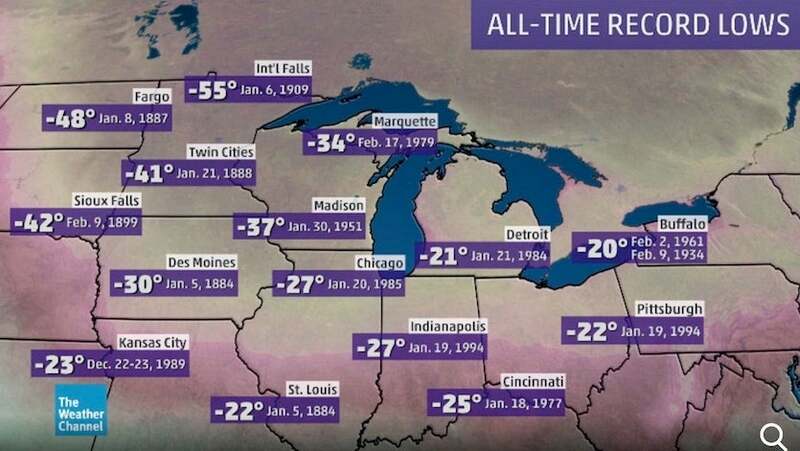 All-time lowest temperatures recorded across the Midwest. Recordkeeping across this region extends back to the late 1800s. 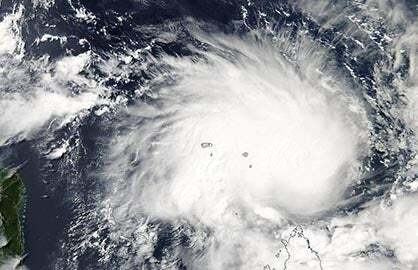 Image credit: weather.com. The current cold blast has not set any all-time record lows at any major stations with a long-term period of record thus far, though several stations in northern Ontario have come within a few degrees of doing so. At least four Midwest U.S. cities have a chance of setting an all-time cold record Wednesday or Thursday morning, though: Chicago (predicted low, –25°F, record low, –27°F); Rockford, Illinois (predicted low –30°F, record low –27°F); Cedar Rapids, Iowa (predicted low –35°F, record low –29°F); and Waterloo, Iowa (predicted low, –34°F, record low, –34°F). For comparison, in January 2018, 11 major stations globally set all-time cold records in January, and 16 set all-time heat records. For the year 2018 as a whole, 430 stations set all-time heat records, and 40 set all-time cold records. With global warming steadily increasing the baseline temperature of the planet, it becomes harder and harder to set all-time cold records. Temperatures on Wednesday in Chicago are predicted to be at near-record cold levels—about 40 degrees below average—for both the high and low: a high of –14°F (all-time record low-high was –11°F on January 18, 1994) with a low of –25°F (all-time record low was –27°F on January 20, 1985). The temperature was 35°F in Chicago on Monday morning, which means the mercury could plummet 60°F in less than 72 hours. But the near-record cold will be replaced by temperatures about 10°F above average over the weekend. Chicago’s forecast is for a low temperature of 34°F for Saturday night, and a high of 41°F on Sunday, which would be 66°F above the predicted low this Wednesday. Temperature swings of this extremity are very rare for Chicago. According to Gilbert Sebenste, "The extreme freezing and thawing and frost wedging/upheaval is going to cause major problems with roads. Expect very numerous potholes, large ones at that, developing over the next two weeks. Expect cryoseisms [ice quakes] Tuesday through Friday, caused by the rapid freezing of water in ground cracks and crevices." Moreover, he adds, "in about seven to nine days, when all of this starts to melt rapidly, expect dense fog and the possibility for ice jam flooding on rivers."